Eli Manning was inspired by the many scout troops, schools and youth sports teams raising money for Tackle Kids Cancer. He created Eli’s Challenge to inspire others. With Eli’s support, the community has raised over $500,000 since 2016 through Eli’s Challenge. In 2018, Eli has once again committed to matching community donations. This year, he pledged an unprecedented $200,000 in support. Every dollar raised funds research and patient care programs at the Children’s Cancer Institute at Hackensack Meridian Health. Join Eli and the New York Giants to Tackle Kids Cancer. Thank you for taking Eli's Challenge! Click the “Register” button to help fundraise as an individual. Click the “Form a Team” button to create a team, recruit others to join, and fundraise as a group. Click the “Join a Team” button to become part of an existing team and fundraise as a group. Had a team in 2016 or 2017? You can continue fundraising using that same link. Log into the Participant Center to make any updates and continue fundraising! Not part of a team, but want to help? Click the “Donate” button and support a team or a participant, a specific participant or directly to the campaign. Donations may also be mailed to: Tackle Kids Cancer, c/o HackensackUMC, 160 Essex Street, Suite 101, Lodi, NJ 07644. Please Include “Eli’s Challenge” and the name of the team you are supporting in the memo. *Eli’s Challenge is open to individuals, community organizations and non-corporate groups. 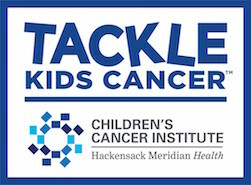 Companies and for-profit corporations that would like to support Tackle Kids Cancer, please contact us at TackleKidsCancer@HackensackMeridian.org or 844-775-KIDS (5437).